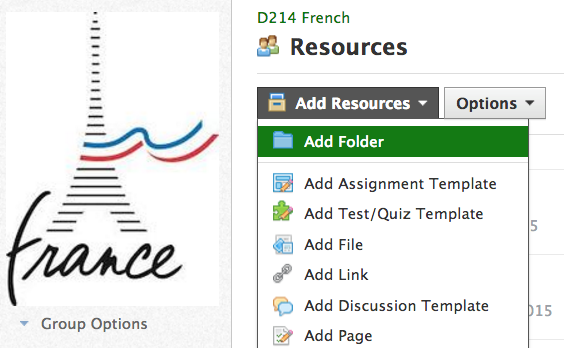 As a French teacher in a small program, I never have a course-alike team in the building. I have learned to survive by relying on my colleagues throughout the district. 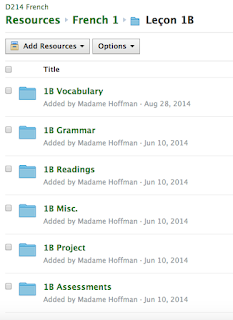 Together, we created a Schoology group where we house shared resources. 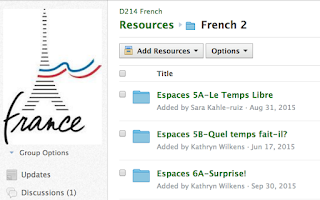 We might not all implement the same plans at the same pace, but we do have an awesome collection of teacher-created resources at the click of a mouse. This has the added benefit of acting as a back-up of important files. The Schoology group is especially helpful when a new colleague joins the team. We don't have to find and share individual files. 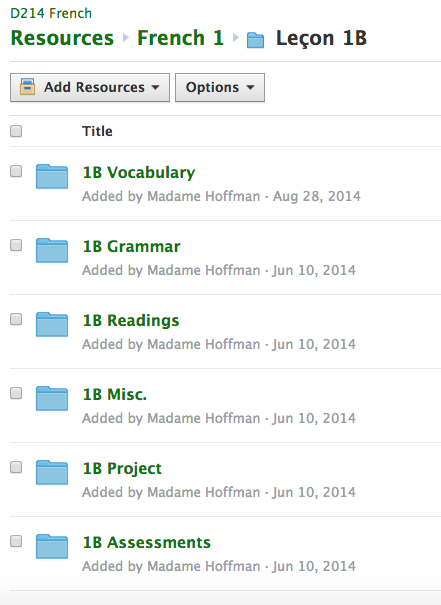 We just add him or her to the Schoology group and everything is already there. Here's how it works. Log in to your Schoology account. Create a Schoology group. Have your colleagues join and make everyone an administrator. 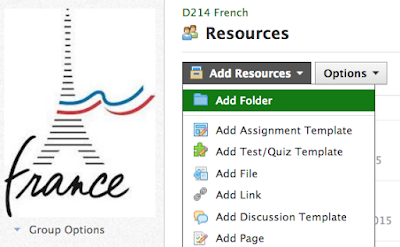 Then within that group, create a shared resource folder. Agree on a protocol for organizing your folders. The district French team, for example, created a folder for each level of language (French 1, French 2...). Within each of those folders, we created folders for each unit of instruction. Then we broke down our documents into Vocabulary resources, Grammar, Assignments, Summative Assessments, etc. Once we had a common system of organization, we took the time to upload our favorite materials (in .doc format so colleagues can revise). Now that the system is in place, we continue to add new materials during workshop time as well as throughout the year. 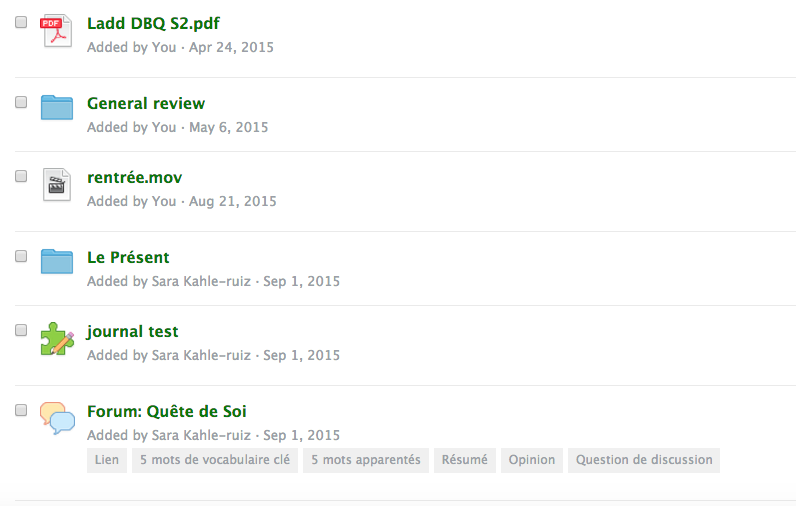 I took a class last summer with a colleague on flipping the classroom and the two of us created Schoology grammar checklists for every unit in first semester of French 2. We shared these with the group so everyone can use them and no one has to duplicate the work. 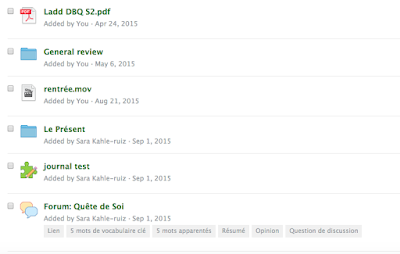 When one of us creates a new formative quiz in Schoology, a writing prompt with a Schoology rubric, or a video for a flipped lesson, we upload it to the appropriate folder and let our colleagues know that there is a cool new resource. This has been such a time saver! I'd like to offer a quick shout-out to my amazing district French team: Effie Kalkounos (EGHS), Sara Kahle-Ruiz and Sharon Horwath (RMHS), Kathy Wilkens and Jenna Sandstead (PHS), Barbara Meyer and Zaya Denardo (BGHS), Elyse Hoffman (WHS), Betsy Noble and Valerie Miceli (JHHS). They are all amazing and creative educators who inspire me to be a better teacher. Merci, mes amies!